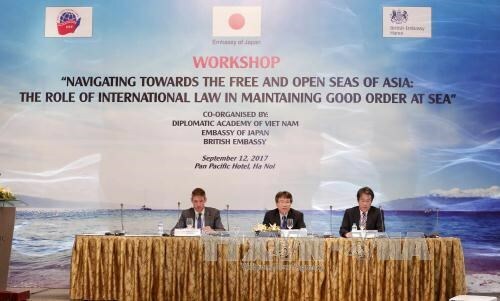 Hanoi (VNA) – “Navigating Towards the Free and Open Seas of Asia: The Role of Maritime Law in Maintaining Good Order at Sea” was the theme of a workshop in Hanoi on September 12. The event, which was held by the Embassies of the UK and Japan in Vietnam in conjunction with the Diplomatic Academy of Vietnam (DAV), brought together experts from the UK, Japan, Singapore, China, Malaysia, the Philippines, India and Indonesia. The workshop stressed the importance of the rule of law in maintaining peace and security at sea in the region and discussed practical measures to narrow gaps of awareness between countries of ensuring maritime security and enhancing economic development. The participants also talked about how ASEAN and its partners can coordinate with each other to maintain order at sea. In his opening remarks, DAV Director Nguyen Vu Tung said the ruling by the Permanent Court of Arbitration in 2016 should be considered the initial step that helps clarify regulations stipulated in maritime law and develop policies regarding disputes in the East Sea. UK Ambassador to Vietnam Giles Lever stressed remarkable developments since the court issued the ruling, saying the UK understands that the decision is binding and should be respected. The adoption of the framework of the Code of Conduct in the East Sea (COC) is an important step as it creates conditions for the COC to become a meaningful document that can promote cooperation and peaceful development in the East Sea.